Math? Ideas? Another linky? Hop on over and check out all these math ideas! 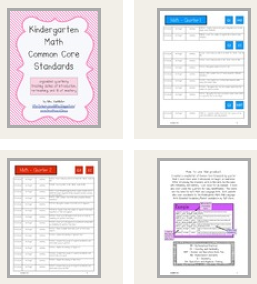 My Kindergarten Math Data Pack is now available at my TpT store. It includes the curriculum map for kindergarten math according to the Common Core standards. I have color-coded the quarters which also correlate to the Language Arts and Essential Vocabulary Packs. I know this is a short post, but there will be more to come this week from myself and colleagues. This is great! I will share it with my Kindergarten teachers! StephanIE found my blog and followed for you all (I just read her pet peeve). :o) You guys are so smart to share a blog. I'm your newest follower. Don't you just love the blogosphere?? ?